Petoskey has so much to see and do. Only listing 10 of them, well, that's a tough assignment. 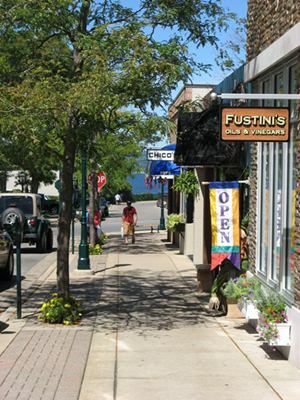 Petoskey's Gaslight District is well known as a beautiful downtown shopping district. So what are 10 places to explore in Petoskey? *Great shopping with wonderful shops in in the Gaslight District. *A variety of restaurants ranging from family to fine dining and coffee shops. *The Petoskey Library and two book stores. *The Crooked Tree Arts Center complete with a theatre and a gallery. *The Little Traverse History Museum in a restored train depot. *A vibrant waterfront with a marina, picnic tables, playground, and even a waterfall. *The Little Traverse Wheelway that connects Petoskey to Charlevoix and Harbor Springs. *Pennsylvania Park with benches and picnic tables and the spectacular, new Bear River Valley Recreation Area. *Downtown activities like Concerts in the Park twice a week during the summer, Art in the Park, Sidewalk Sales, and the Winter Blues Festival. 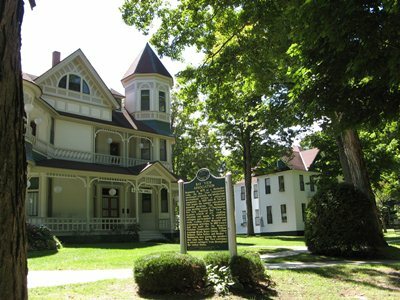 *Walk through Petoskey's history with a self guided tour through the downtown area. *The Bay View Association filled with music, theatre and entertainment. *Harris Gardens at North Central Michigan College is filled with sculpture and beautiful landscaping. *Petoskey Stones line the beaches. *Skiing at Boyne Highlands and Boyne Mountain. *Petoskey State Park for swimming, dunes, camping, hiking and more as well as several Petoskey Parks to explore. *A perfect location on the Little Traverse Bay for boating, fishing, sailing, kayaking, and swimming. *Outdoor activities for all season with nearby hiking trails at North Central Michigan College, Bay View, and the North Country Trail. Yes, the Petoskey area is filled with places to explore and things to do!